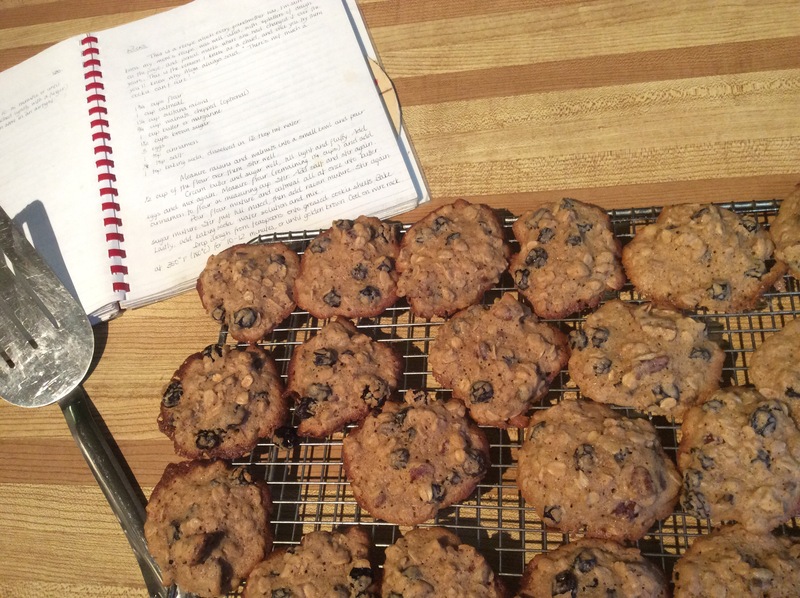 This is one of my Mom’s recipes; they were called “Rocks” in her dough-splattered cookbook, but they taste much better than that! Living in the Okanagan means I get to use my own home-dried raisins, but even with everyday ingredients these remain a favourite. They are chewy, so if you like your cookies crispy add 1/2 cup more flour and bake them closer to 15 minutes. Preheat oven to 350F /175C. Toast nuts for approx. 5 minutes, then chop. Mix raisins and nuts in a small bowl with 1/4 cup flour (this helps them be distributed in the dough). Combine remaining flour, oats, spices and salt in a medium bowl. In a mixer or large bowl, cream butter and sugar till fluffy, then add eggs and beat again. Pour dry ingredients into batter and mix just until blended. Add raisins and nuts and mix slowly, then add baking soda mixture and stir till combined. Drop dough from tablespoons onto greased cookie sheets (or use silicone mats to avoid extra fat). Bake for approx. 10-12 minutes or until golden brown. Cool on wire rack and store in airtight container.